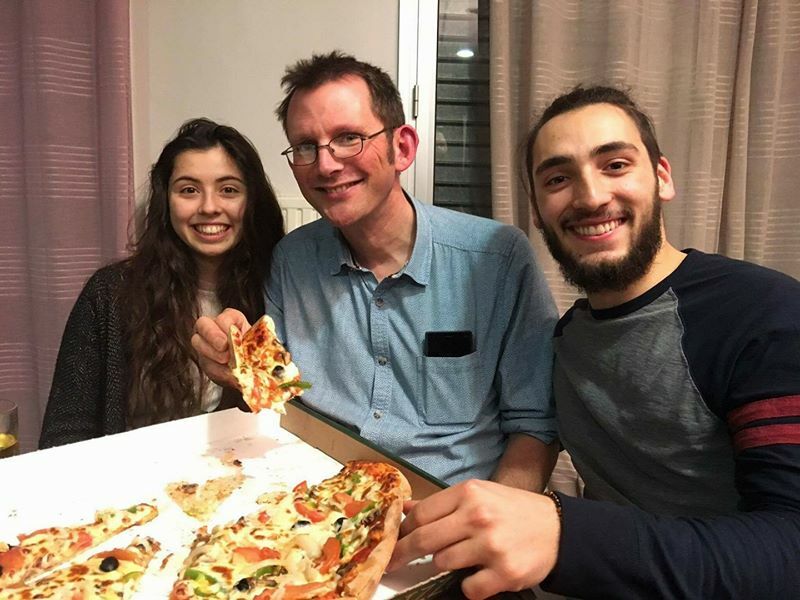 Rob Hopkins - "Now you’re all here, it feels fantastic" - 3 days in France. When people invite me to speak somewhere, I usually say that if I am travelling to get there, to make the best use of me while I’m there. This trip certainly did. 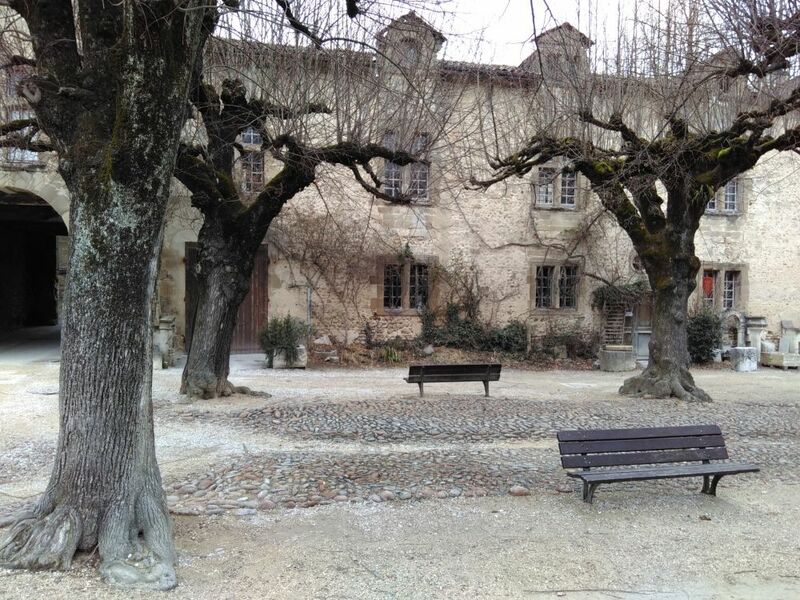 After arriving by train to Valence TGV station, my first night I was hosted in a beautiful house up in the hills in walnut country. 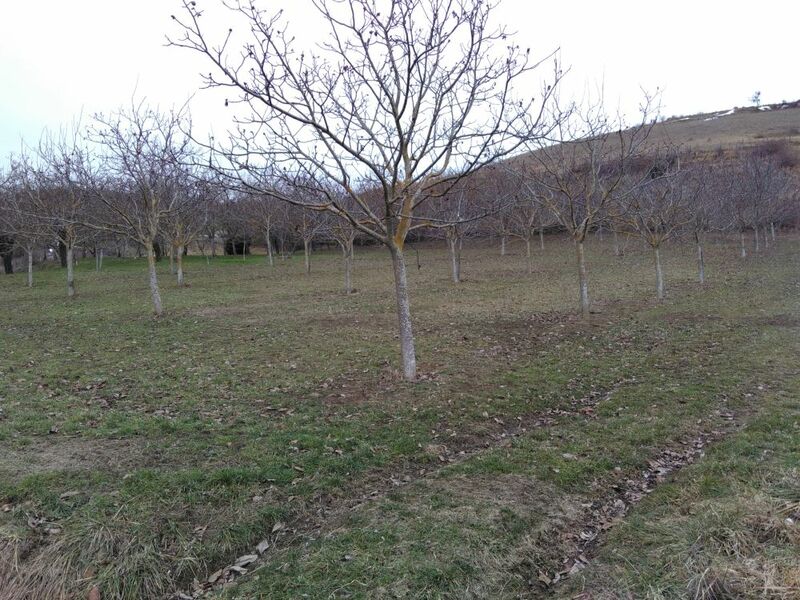 All around the house are walnut trees, in a region renowned for its dishes and drinks based on this most splendid of nuts, the Queen of Trees. 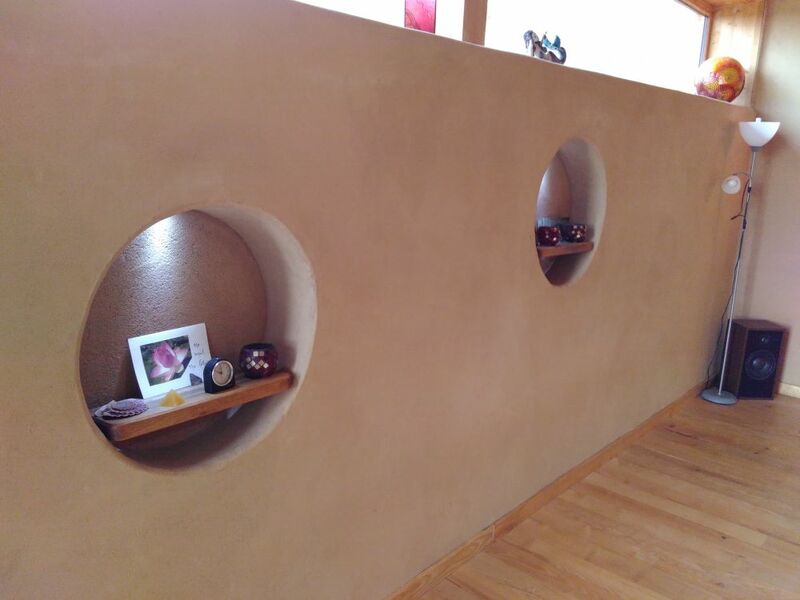 The evening I arrived I met some local activists, and in the morning I got to spend some time with my host’s son, Noé, a highly skilled natural builder and clay plasterer, who had built a beautiful studio onto the side of the house which she uses for her constellations work (see below). We wandered around the (freezing) ancient church, and then were invited by the L’Arche Community there (a residential community founded on Gandhian and Non Violent Communication) to lunch. 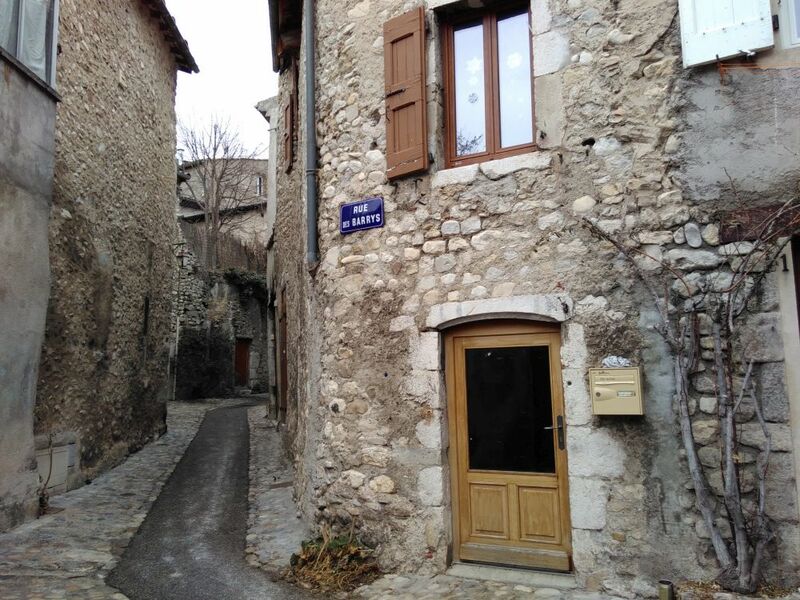 We had a great meal and a lovely welcome, washed up our dishes, had a walk around looking at their food gardens and immaculate woodpiles (always a key resilience indicator for me), and continued on our way to Grenoble. 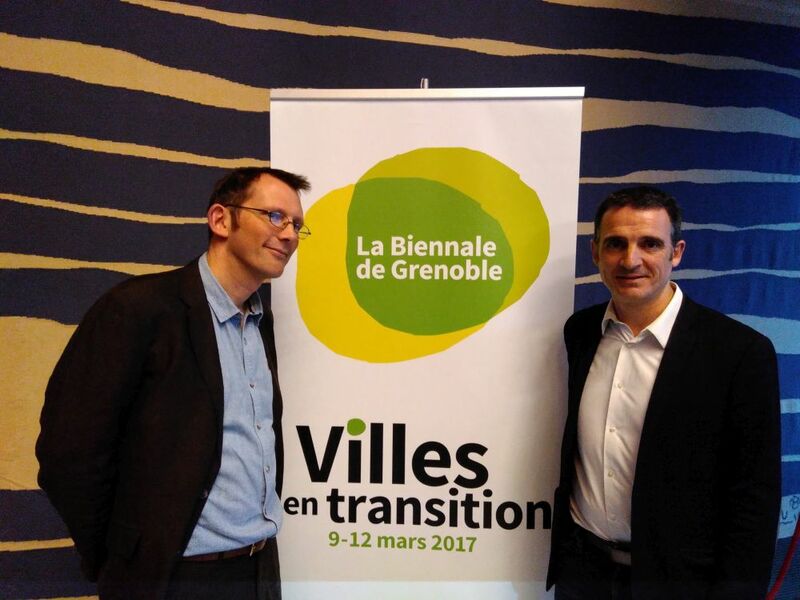 Grenoble is the only city in France to have elected a Green Mayor. 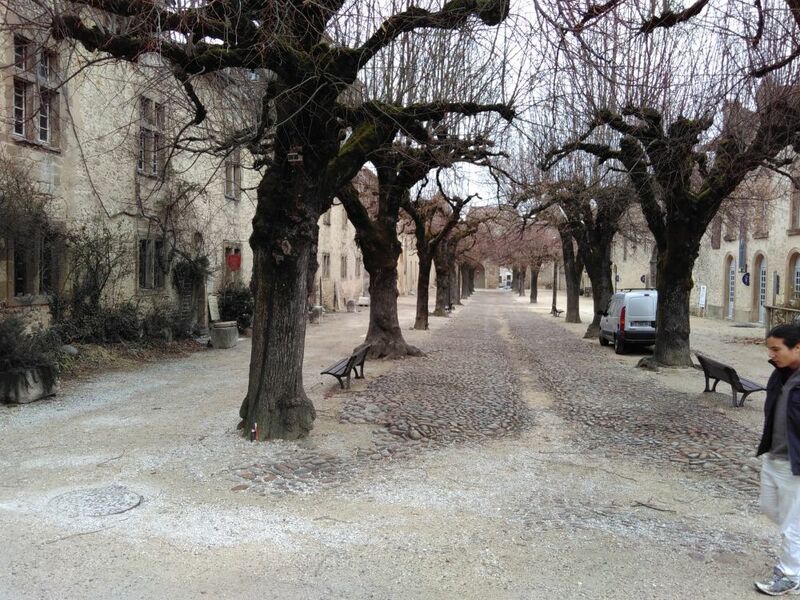 It is also a city, like several others in France, suffering from a severe air quality problems. The day we visited, special measures were in place to respond to a spike in air pollution caused by weather conditions (and by all the cars of course, and the heavy industry). On such days the speed limits in and out of the city are reduced. 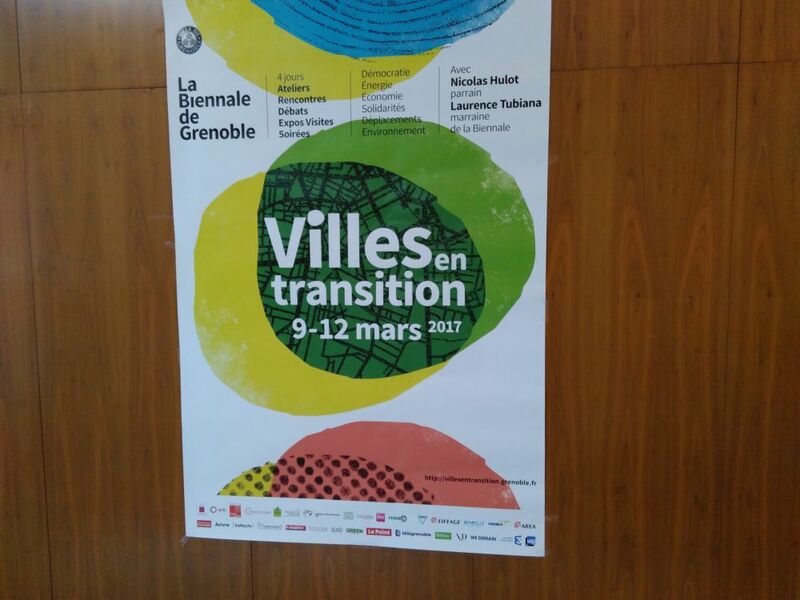 Grenoble’s city government are launching a Biennale in March on the theme of ‘Villes en Transition’ (‘Towns in Transition’). 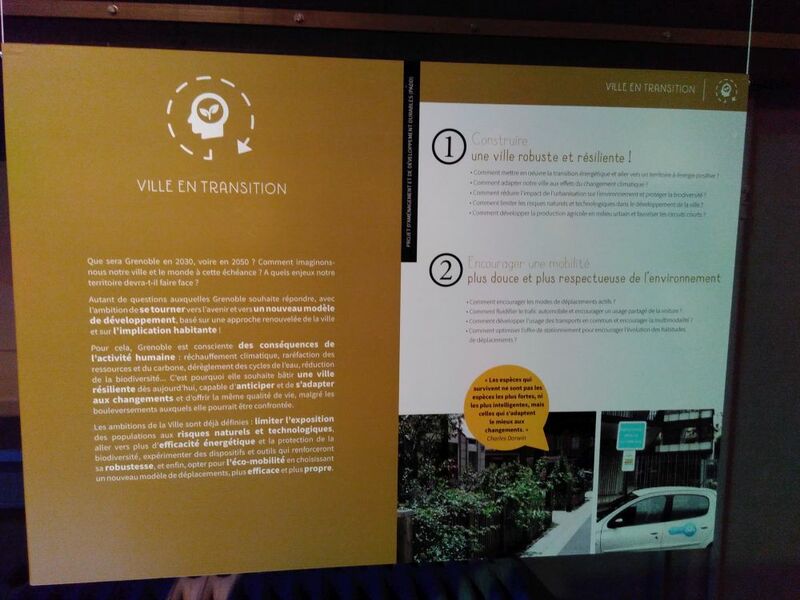 It’s an ambitious programme, with the theme being used to introduce a local currency for the city (‘le Cairn’), a rollout of bicycle lanes, renewable energy and lots more. 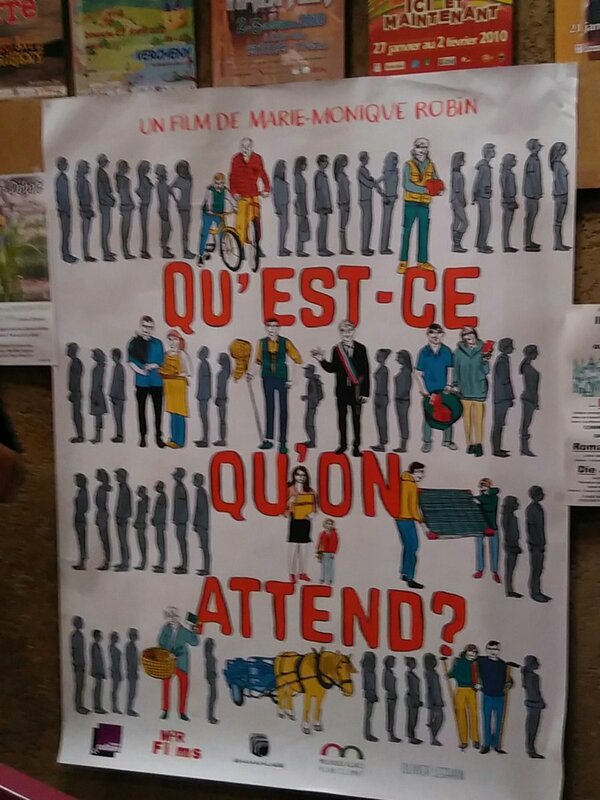 The film ‘Tomorrow’ (‘Demain’) has led to a remarkable engagement of young people in issues around sustainability. 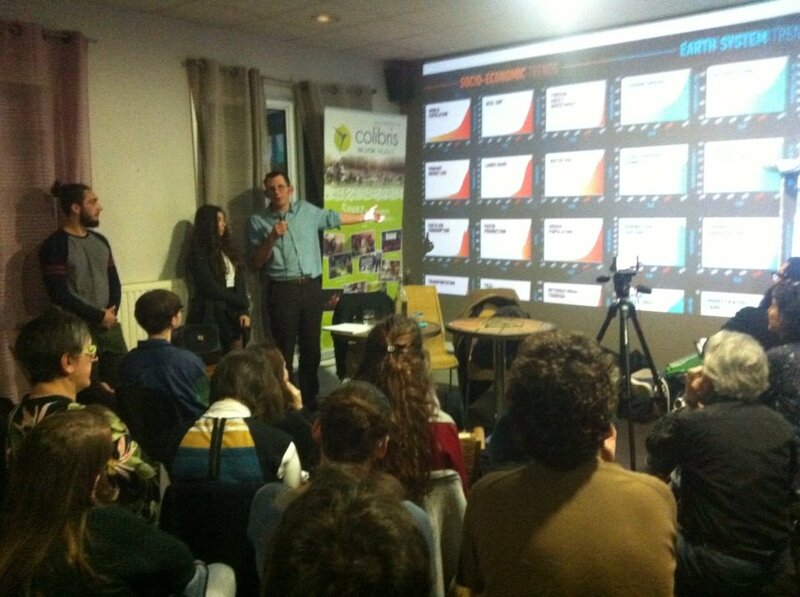 A recent survey found that, for the first time in many years, ecology now polls as being the key issue of concern for the young people in France. And it certainly was noticeable in all the talks I gave how many young people came. 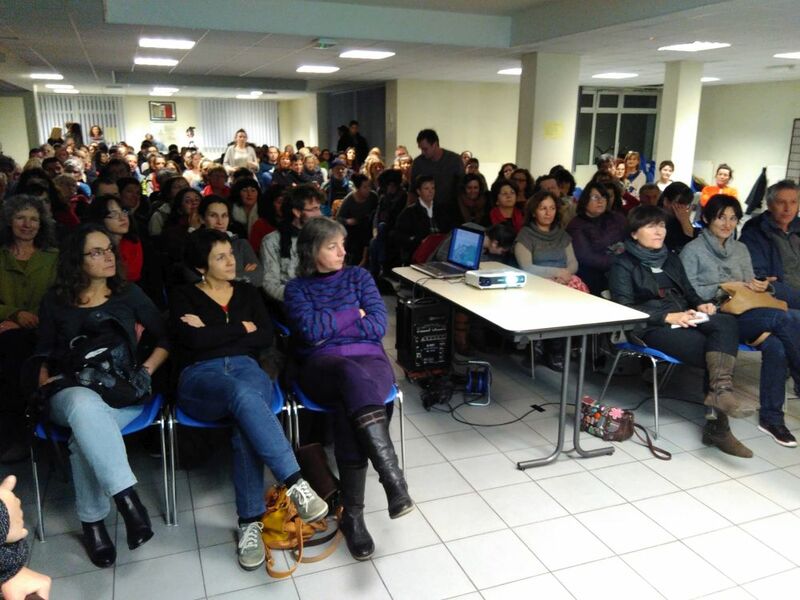 The talk in Grenoble was rammed, and people were really engaged, my talk very well received. 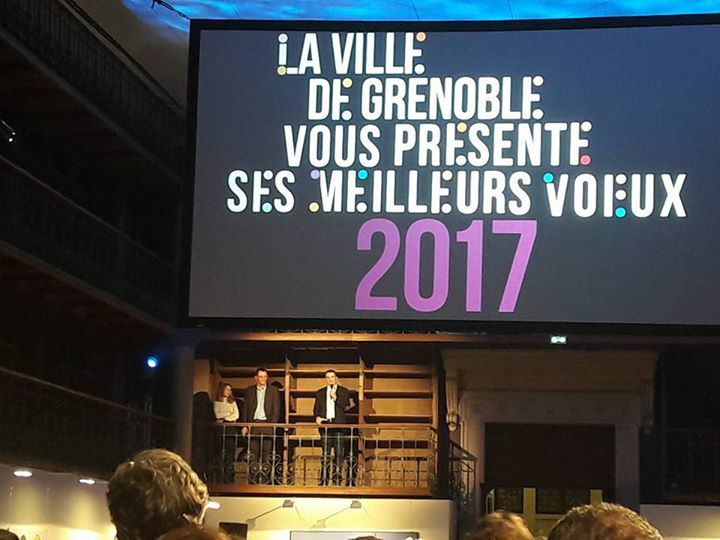 After this, the Mayor (see above) talked about their plans, and we were then invited to an event in a beautiful venue in the city where he was to formally announce the launch of the Biennale. 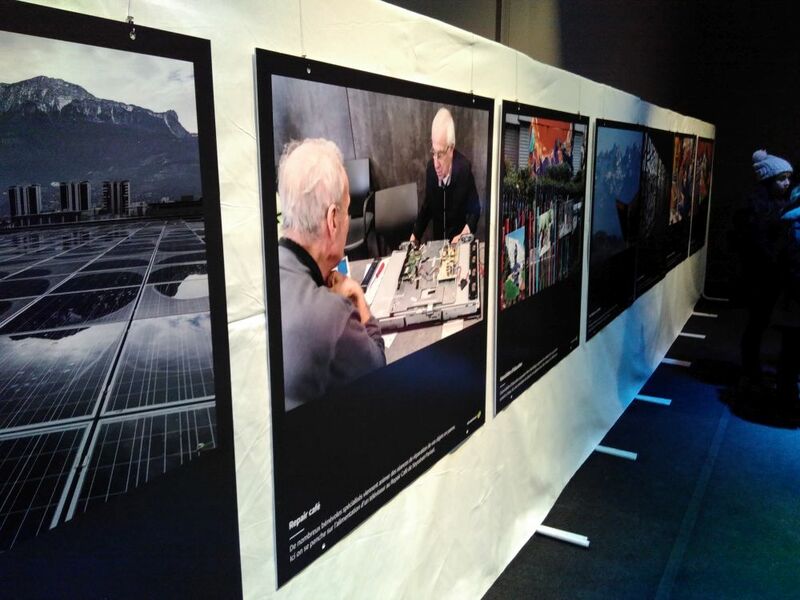 There was a beautiful photographic exhibition by Bernard Meric, a photographer who had gone around the city seeking out examples of resilience that already exists: bike repairers, repair cafes, solar energy projects and so on. 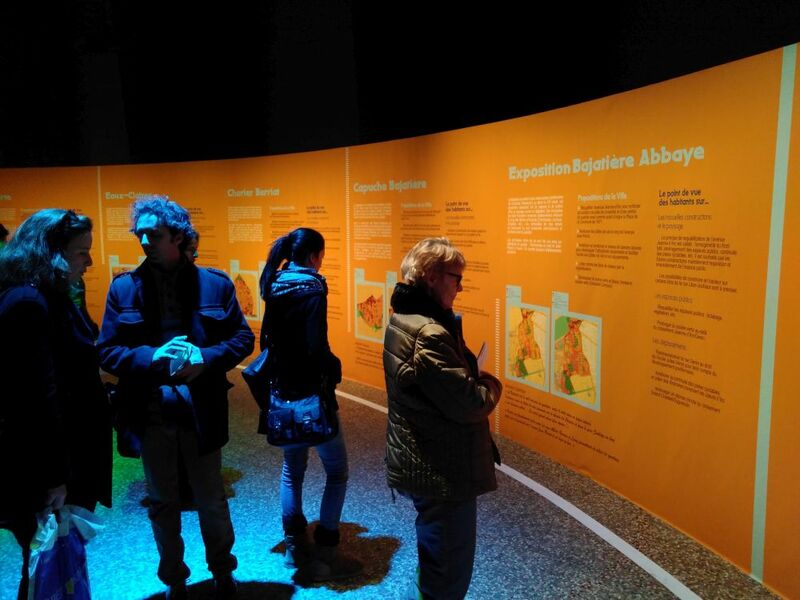 There was also a detailed setting out of the plans for what the City wants to achieve during the Biennale. The hall was packed with dignitaries and other local people for the launch. From there we headed to the town of Romans to do another talk (I told you it was a packed programme!). Always an odd experience to drive into a town with your face plastered onto trees along the main street. 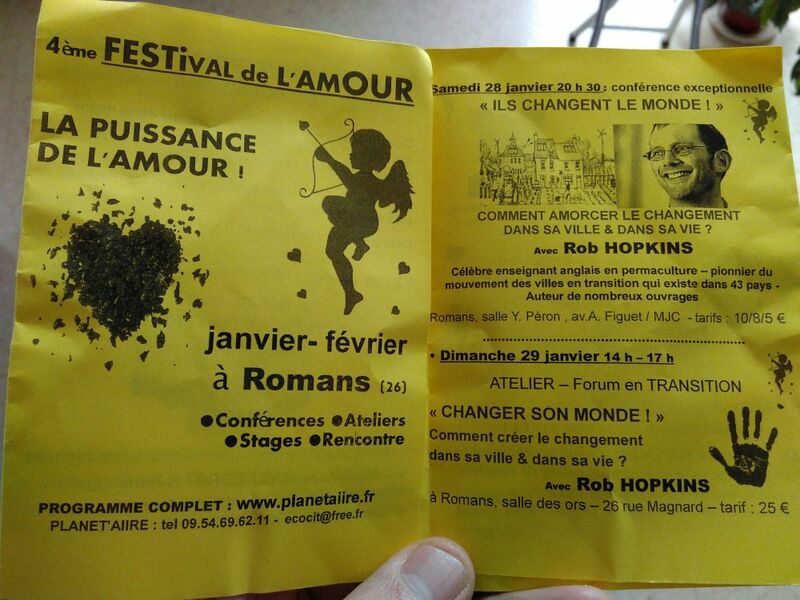 The talk was part of a bigger programme, called ‘The Festival of Love’ (no sniggering at the back there…). First time I’ve ever spoken at one of those! A couple of hundred people this time, again lots of young people, and some great interaction and participation. My young translators did a great job, and we all finally sat down for a shared meal at about 11.30! The next day we visited a new house being built by my host Patrice. 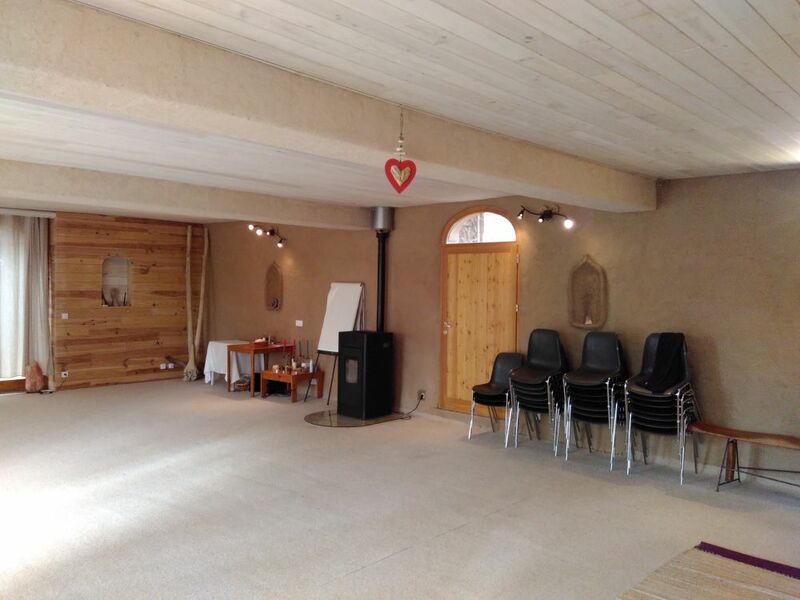 A beautiful timber frame, strawbale and clay-plastered house, with a movement studio on the ground floor and living space above. 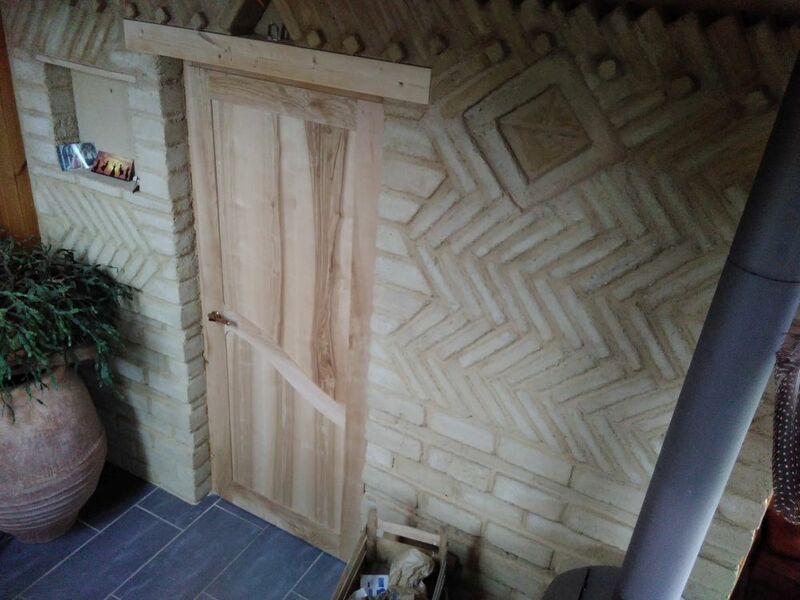 The studio is finished and in use, the rest is still a building site. 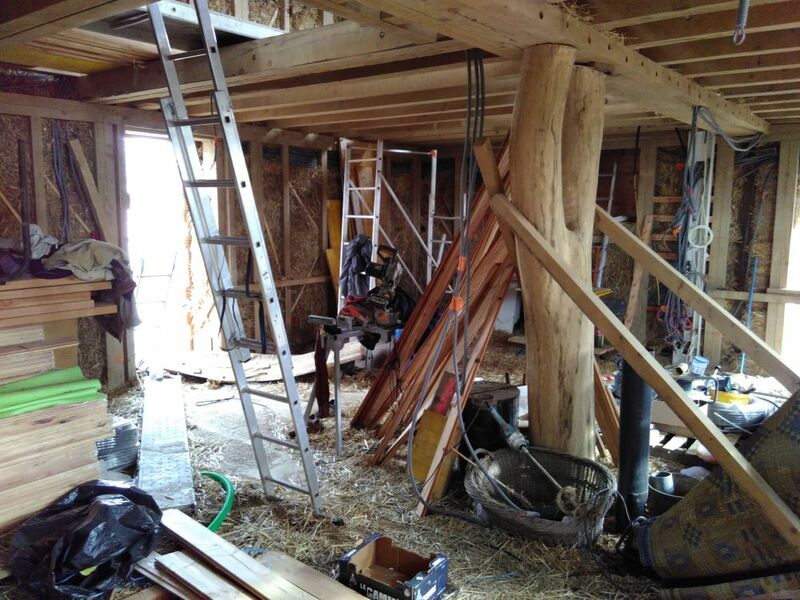 Always wonderful to see natural building in process! We then met Bernard, who invited us to his home for lunch, and to discuss the workshop that he and I would be facilitating later that day in Romans. The workshop ran from 2-5, and about 30 people had come. It was an opportunity to reflect deeper on the mechanics of Transition, on what people felt to be the obstacles to their getting involved. We talked about the 7 Essential Ingredients of Transition, the Transition Animal, and other things too. Our next port of call was Lyons, for a talk. En route we stopped off with Estelana’s family, who were extremely hospitable, feeding us delicious food in the few minutes we had before we set off for Lyons. Lyons, like Grenoble, as well as Paris and several other places, had travel restrictions in place due to the pollution spike. We were running against the clock, trying to get there in time for a talk that was set to start at 7. The initial idea had been to get a larger venue, but this hadn’t proved possible, so they had booked a place with a capacity of 130, and all the tickets had sold out in the first day! Not knowing Lyons, and getting a bit lost, meant we actually arrived at 7.50pm, but nobody seemed to mind too much. It did mean though that we got to pass this particular scene, which struck me as being rather delightfully romantic. The room for the talk was rammed, again with lots of younger people, and a really engaged crowd. The talk was also being streamed live on Facebook, with over 2,000 people watching. We had a great discussion, some great questions, great involvement, really a very lovely evening. 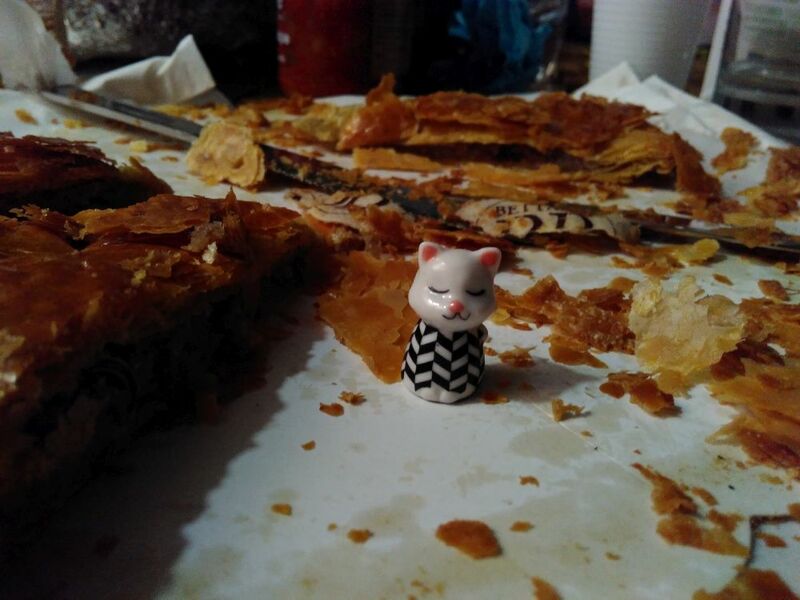 It all wrapped up with us sharing a vast pizza (below, with Estalana and Tristan), and a regional almond cake which includes 2 porcelain figures, one to represent a king and a queen (see below … king as small cat strangely…). Everyone knows this, but not me… I nearly broke a tooth! We then headed back on the long drive to Romans, where I was sleeping the night. 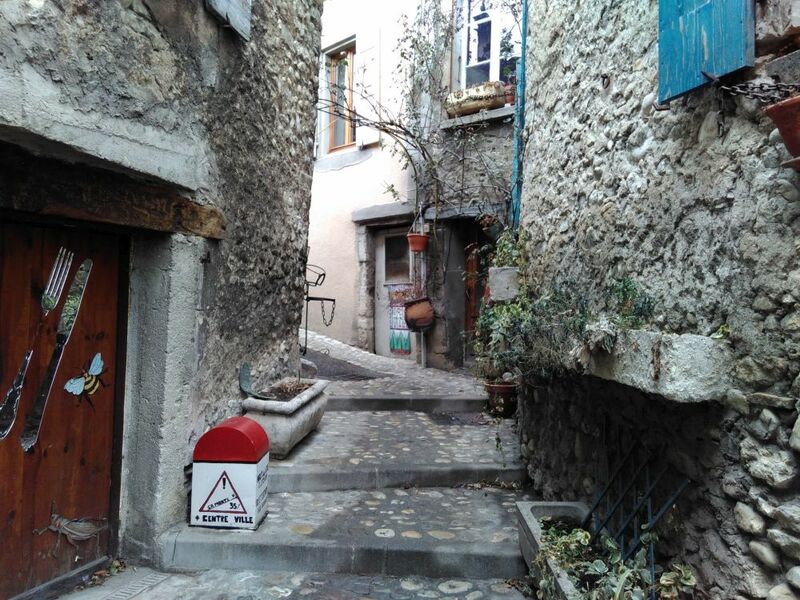 For the last day, I was to speak at Ecologie au Quotidien (‘Everyday Ecology’) in the town of Die, up in the foothills of the Alps. In summer a popular tourist resort, it is also home to many people who move there for the clean air, the healthy lifestyle, and the alternative, creative culture of the place. This annual event is in its 15th year, and runs over 9 days with a dazzling array of workshops, talks, film screenings and practical events. Die is situated in the Biovallée Drôme, an entire valley region that is pushing to be the first 100% organic valley in France. 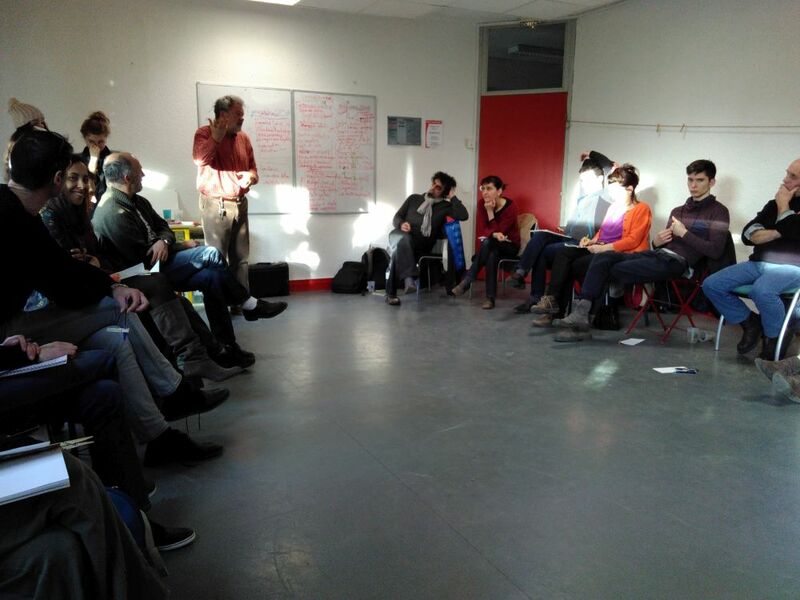 I was part of an Open Forum in the afternoon, facilitated by Coraline Monnot. 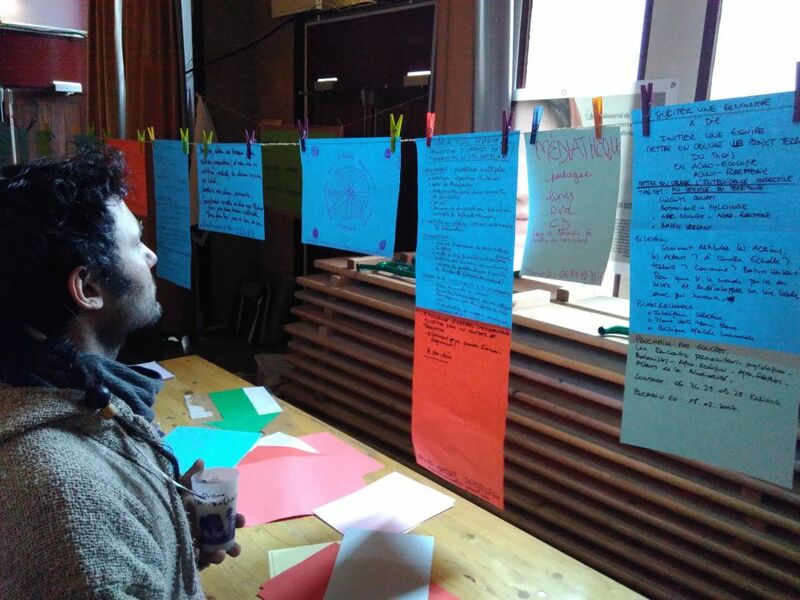 It was a kind of Open Space looking at what are all the projects already underway in the area, and how might they connect more effectively. I gave a short presentation at the outset looking at the 7 Essential Ingredients as a valuable foundation for any successful group project and then people broke into groups to discuss their ideas. During that time I went for a walk around Die with Tristan and Estelana, wandering around beautiful lanes where I was able to go into Pattern Language raptures, enjoyed the mountains that ring the town, bought some bottles of beer from one of the 7 (!) small breweries around the town, and checked out the church. We got back in time for the concluding of the session, of people posting their many great ideas around the room. I was reminded once more of the distinction between a conventional consultation and Open Space. In the former, people are invited to give ideas in the hope that someone else might do that, a giving away of their power to those empowered to make the decisions. In the latter, people bring their passion, a question that they need to share, a proposal that they are seeking the support of others for. It unlocks energy to make things happen, it concentrates the focus around making projects a reality. I was then invited to give some last thoughts, some feedback on the process. There was then a bit of down time before supper, and the preparation for the evening’s climax, the screening of the film ‘Qu’est-ce on attend?’ (‘What are we waiting for?’), which I previously reviewed here. Jean-Claude Mensch, the Mayor of Ungersheim, and star of the film, and his wife Martine, had come for the screening. 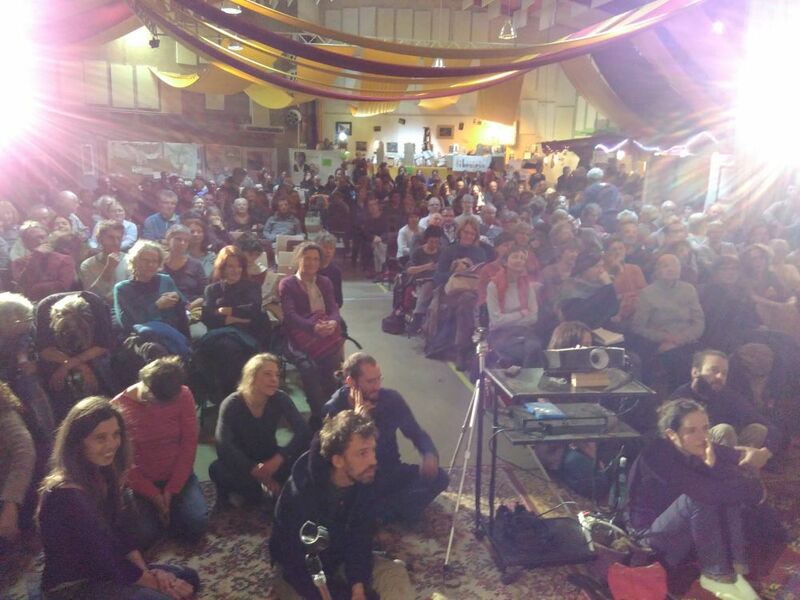 After the evening meal, the room was re-arranged for the screening. People arrived, and arrived, and arrived. The audience kept growing, so that at 8pm, the time the film was meant to start, there was still a lot of dashing around getting more chairs. And more chairs, and more chairs. In the end, about 700 people were crammed into the hall, and the film finally started at 8.20. I’ve already seen it before, but it was fascinating to see it with a French audience. I watched it on my own, with English subtitles, but it was great to see how funny everyone found it, with particular parts of the film getting rounds of applause. Even a technical fault that meant the whole thing stopped in the middle for around 10 minutes, didn’t seem to dampen people’s enthusiasm. The end of the film was greeted with rapturous applause. Jean-Claude and I were invited onstage, and answered questions and shared some thoughts. There was an amazing energy in that room. If I could bottle it and sell it I’d make a fortune! It was the energy of possibility, of connection, of renewal, and, yes, of resistance. 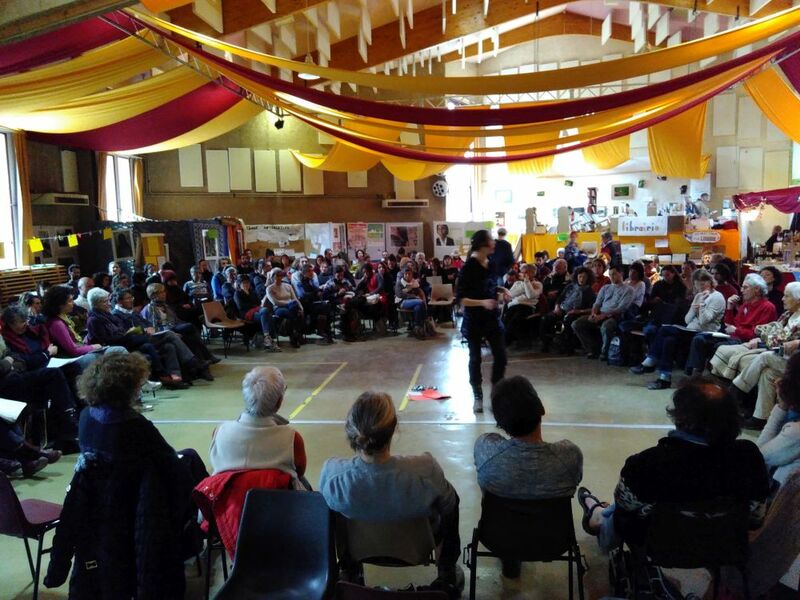 There was a wonderful shared sense of inspiration, a sense from the Ungersheim story that, as Arundhati Roy puts it, “another world is not only possible, she is on her way. On a quiet day I can hear her breathing”. It was a very special time, felt really powerful somehow. Sadly, at 11.30 I had to make my excuses (everyone else was still going strong!) as we still had an hour’s drive back to Romans, and I had to be up for the 6am train home. A wonderful, inspirational trip. While I was there, climate change denier, fossil-fuelled fruitloop and Donald Trump advisor Myron Ebell was quoted as saying that the environmental movement is “the greatest threat to freedom and prosperity in the modern world”. One could be quite forgiven for responding “takes one to know one”. 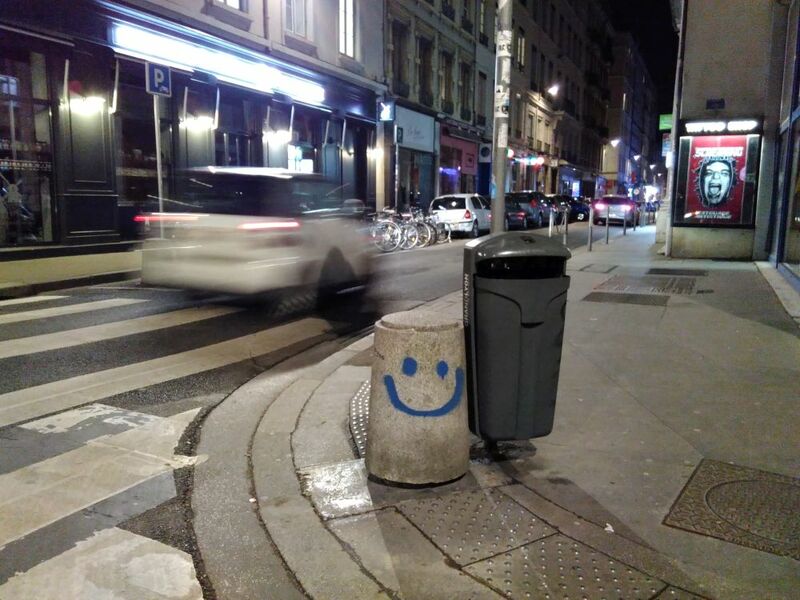 But it clear in France that people are building networks, that young people are getting fired up, imagining a new future, the opposite to Ebell’s nonsense version of the future, and they are fired up by the whole possibility of now being the time to create a whole better world. My favourite moment on the trip came near the end of the afternoon workshop in Romans. 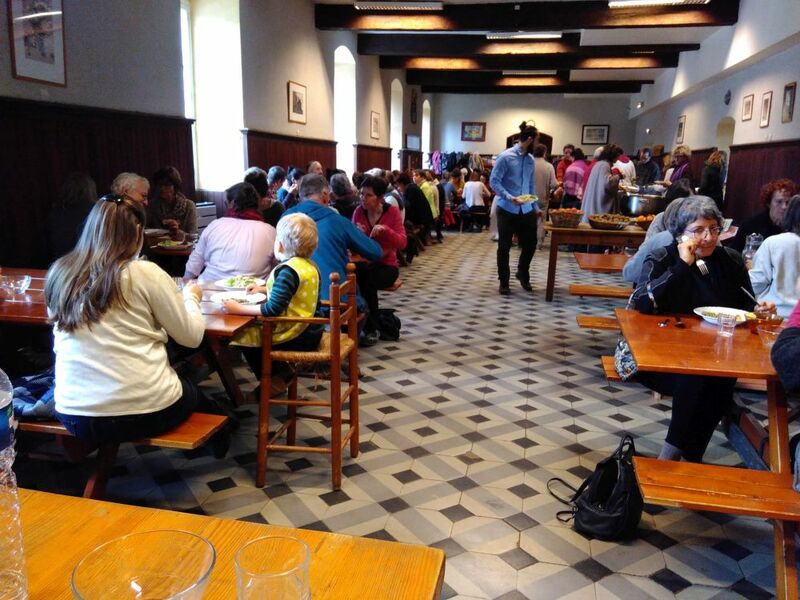 An older couple had to leave early, and so stood up to offer their apologies for leaving. “I just wanted to say”, said the man, “that I feel so very pleased to see people of so many different ages here today. For years, events like these have just been people like me”. He took off his hat and pointed to his mop of white hair. “Now you’re all here, and it feels fantastic”, he said, before giving the room a hearty wave and then heading off. 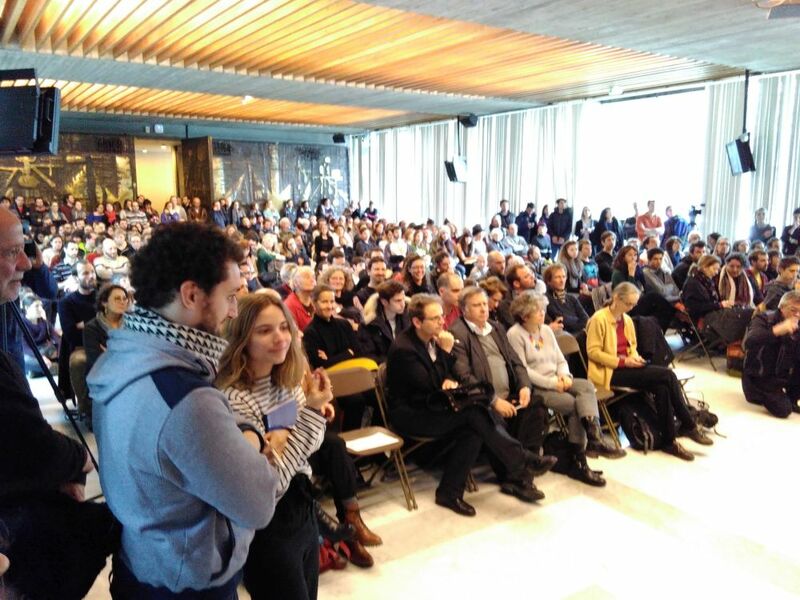 My thanks to Eve, Tristan and Estelana, my wonderful translators, to my hosts, to Patrice for the invitation, to the good people at the Grenoble city government, to everyone who came to the talks, and to those who were unable to get in. All social change mouvements need strong and charismatic leaders. Your are one of them, with a accurate description of the energy/climate/social nature of the crisis, as well a a strong positive attitude that drives and inspires innumerable transformations everywhere. We are entering a time of great uncertainty: Trump in the US, somewhat chaotic pre-presidential election time here in France… Keep up the good work! 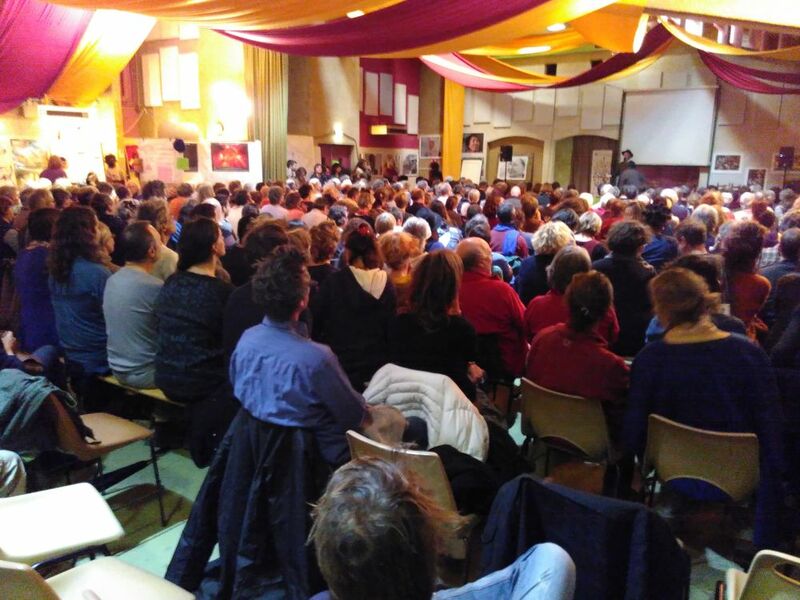 Corinne reflects on COP21 in Paris.